NEW YORK CITY, N.Y. – The New York Knicks picked up a quality win over the Boston Celtics, prior to a match-up with the New Orleans Pelicans. Friday night, the Knicks looked to make it back-to-back wins for the first time in this young season. Back on Nov. 16, New York lost to the Pelicans in New Orleans in a game that they lead for most of the contest. The Knicks have had several games like that this season, in which they haven’t been able to close the case in the 4th quarter. (Photo Credit: Barry Holmes) Mudiay driving to the basket for a late game score. 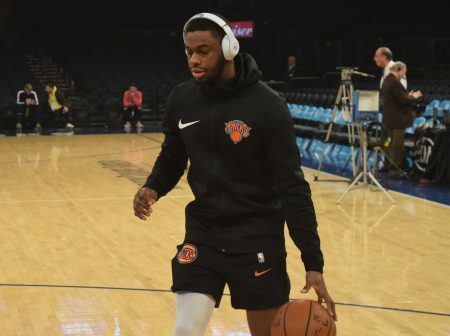 Emmanuel Mudiay has played well in his last five games, as he is averaging 15.8 ppg in those contests. Mudiay was a catalyst for the Knicks on Friday night as he finished the game with 27 points, including 15 points coming in the 4th quarter. However it wasn’t just the scoring that made Mudiay so effective. Mudiay played with great energy and pace which was infectious for his teammates, as he added seven rebounds and four steals. The way that Mudiay was aggressive penetrating to the basket, really put pressure on the Pelicans defense. Mudiay converted on six out of seven free throw attempts, including late ones to put the game on ice. With the resurgence of Mudiay at the helm, we saw Frank Ntilikina take a diminished role logging just 14 minutes of action. It will be interesting to see how Coach Fizdale continues to handle the rotation of his talented back court. Tim Hardaway Jr. had one of his worst shooting performances of the season. Hardaway Jr. has been the Knicks main scoring option this season, and the Knicks depend on his scoring production. Friday night, Hardaway Jr. shot 2 for 15 from the field and logged just seven points. Allonzo Trier (25 pts) and Enes Kanter (17 pts, 12 rebs) provided the lift offensively to catapult the Knicks to win. Noah Vonleh (14 pts, 11 rebs) also added his third straight double double. The Knicks are going to have to find a way to score consistently outside of Hardaway Jr., considering the high volume of perimeter shots that Hardaway Jr. takes. Jump shooters are going to have rough nights, so it’s important that New York continues to be aggressive attacking the basket and scoring in transition. (Photo Credit: Barry Holmes) Davis finished with 33 points, but had just two points in the 4th quarter. Anthony Davis absolutely torched the Knicks for three quarters of this game. Through three quarters, Davis recorded 31 points and 12 rebounds. However, in the fourth quarter the Knicks buckled down and held Davis to just two points in the fourth quarter. 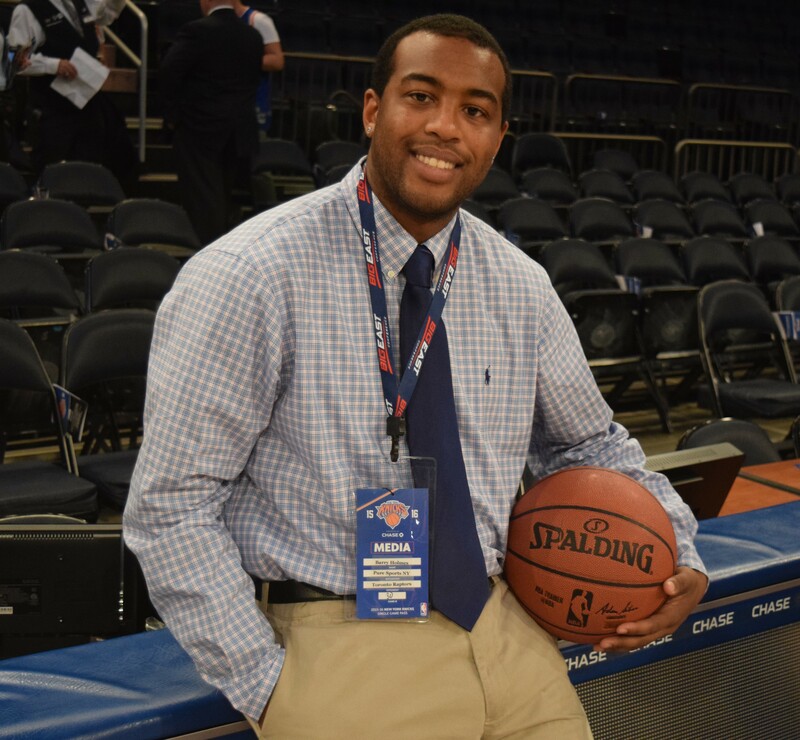 This was key for the Knicks to keep Davis out of the paint, and to limit his second chance opportunities. These are the type of adjustments that veteran teams make, and for the Knicks to stymie Davis like that was huge. This should give the Knicks some confidence defensively as they prepare for Marc Gasol. The Knicks will look to make it three straight wins, as they will face the Memphis Grizzlies (12-6) Sunday afternoon. New York hopes to improve on their unimpressive 3-8 road record this season. Allonzo Trieranthony davisBoston CelticsCoach FizdaleEmmanuel MudiayEnes KanterFeaturesFrank NtilikinaMadison Square GardenMarc Gasolmemphis grizzliesnew orleans pelicansNew York KnicksNoah VonlehTim Hardaway Jr.